← How to convert PRN to Bitmap and set image resolution? 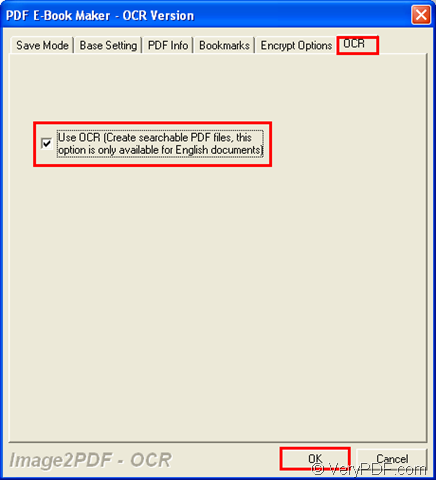 If you want to edit PDF title when you convert image to searchable PDF document, you can choose the applications of VeryPDF—Image to PDF OCR Converter or Image to PDF OCR Converter Command Line as your tool. This article will put emphasis on showing you the two solutions for the conversion with two applications. To download the GUI application or command line application, you need to click the link : http://www.verypdf.com/app/image-to-pdf-ocr-converter/index.html which is the URL of the homepage of these two applications. Please double click the application icon to open the application if you have created one when you install the application. If not, you need to open the installation folder and double click the executable file Image2PDF.exe to open the application. 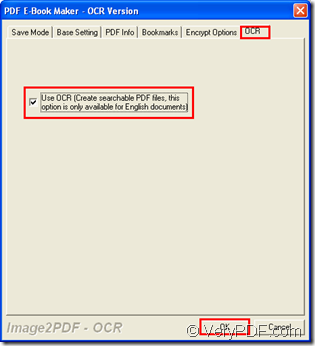 Image to PDF OCR Converter supports to add file by dragging and dropping the file to be converted into the application. Then you will see the file in file list. 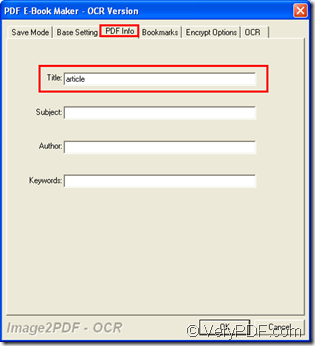 Please click “File (F)” in menu bar and click “Image2PDF Setting” in dropdown list to open “PDF E-Book Maker-OCR Version” dialog box. Then click “PDF Info” tab and input PDF title in “Title” edit box. Click “OCR” tab and check “Use OCR” option in the tab. At last, click “OK” button. You can see these two tabs in Figure 1 and Figure 2. Please right click the image file to be converted and choose “convert selected 1 file into pdf file” option in popup floating item for opening “Save as” dialog box. Then please specify the output location in “Save in” dropdown list and input the name for target file in “File name” edit box. Click “Save” button to run the conversion from image to searchable PDF document. Please click “Start” to open start menu in which you need to click “Run” to open “Run” dialog box. Then input “cmd” in “Open” combo box of the dialog box and click “OK” button. Then you will see MS-DOS interface on your screen. img2pdf stands for the called program which is the executable file in extracted package of Image to PDF OCR Converter Command Line. –t article is the option to set PDF title as “article”. 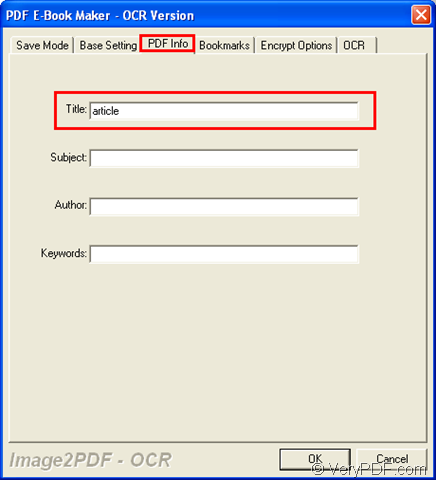 –x 1 is the option for creating searchable PDF document. –o D:\file2.pdf is to specify the path of target file. D:\file1.jpg is the path of source file. For running the conversion from image to searchable PDF document, please hit “Enter” button on your keyboard at last. Is there an easy way to convert WMF to PNM, please? Convert pxl to bmp and set color depth via command line? This entry was posted in VeryPDF Blog and tagged image to searchable PDF, PDF Title. Bookmark the permalink.